Anthem: Մեր ՀայրենիքInvalid language code. Armenia ( /ɑrˈmiːniə/ Armenian: Հայաստան Hayastan), officially the Republic of Armenia (Armenian: Հայաստանի Հանրապետություն, Hayastani Hanrapetut’yun), is a landlocked, mountainous country in the South Caucasus region of Eurasia. Located at the crossroads of Western Asia and Eastern Europe, it is bordered by Turkey to the west, Georgia to the north, the de facto independent Nagorno-Karabakh Republic and Azerbaijan to the east, and Iran and the Azerbaijani exclave of Nakhchivan to the south. ). Ancient Greek Armenia, Αρμενια Αρμένιοι "Armenians" is first mentioned by Hecataeus of Miletus (476 BC). Xenophon, a Greek general serving in some of the Persian expeditions, describes many aspects of Armenian village life and hospitality. He relates that the people spoke a language that to his ear sounded like the language of the Persians. According to the histories of both Moses of Chorene and Michael Chamchian, Armenia derives from the name of Aram, a lineal descendent of Hayk. Armenia lies in the highlands surrounding the Biblical mountains of Ararat, upon which Noah's Ark is said to have come to rest after the flood. (Bible, Gen. 8:4). There is evidence of an early civilization in Armenia in the Bronze Age and earler, dating to about 4000 BC. Archaeological surveys in 2010 and 2011 at the Areni-1 cave complex have resulted in the discovery of the world's earliest known leather shoe, skirt, and wine-producing facility. Etchmiadzin Cathedral – the oldest church in the world built by the state. During the 1230s, the Mongol Empire conquered the Zakaryan Principality, as well as the rest of Armenia. The Mongolian invasions were soon followed by those of other Central Asian tribes (Kara Koyunlu, Timurid and Ak Koyunlu), which continued from the 13th century until the 15th century. After incessant invasions, each bringing destruction to the country, with time Armenia became weakened. 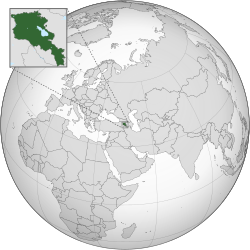 In the 16th century, the Ottoman Empire and Safavid Persia divided Armenia. From 1604 Abbas I of Persia implemented a "scorched earth" policy in the region to protect his north-western frontier against any invading Ottoman forces, a policy which involved a forced resettlement of many Armenians outside of their homelands. In 1813 and 1828 the Russian Empire annexed Eastern Armenia from Persia (consisting of the Erivan and Karabakh khanates ). The Ottoman Empire began to collapse and in 1908, the Young Turk Revolution overthrew the government of Sultan Hamid. Armenians living in the empire hoped that the Committee of Union and Progress would change their second-class status. Armenian reform package (1914) was presented as a solution by appointing an inspector general over Armenian issues. There was local Armenian resistance in the region, developed against the activities of the Ottoman Empire. The events of 1915 to 1917 are regarded by Armenians and the vast majority of Western historians to have been state-sponsored mass killings, or genocide. Turkish authorities, however, maintain that the deaths were the result of a civil war coupled with disease and famine, with casualties incurred by both sides. According to the research conducted by Arnold J. Toynbee, an estimated 600,000 Armenians died during the Armenian Genocide in 1915–16. Although the Russian army succeeded in gaining most of Ottoman Armenia during World War I, their gains were lost with the Bolshevik Revolution of 1917. At the time, Russian-controlled Eastern Armenia, Georgia, and Azerbaijan attempted to bond together in the Transcaucasian Democratic Federative Republic. This federation, however, lasted from only February to May 1918, when all three parties decided to dissolve it. As a result, Eastern Armenia became independent as the Democratic Republic of Armenia (DRA) on 28 May. At the end of the war, the victorious powers sought to divide up the Ottoman Empire. Signed between the Allied and Associated Powers and Ottoman Empire at Sèvres on 10 August 1920, the Treaty of Sèvres promised to maintain the existence of the Armenian republic and to attach the former territories of Ottoman Armenia to it. Because the new borders of Armenia were to be drawn by United States President Woodrow Wilson, Ottoman Armenia is also referred to as "Wilsonian Armenia." In addition, just days prior, on 5 August 1920, Mihran Damadian of the Armenian National Union, the de facto Armenian administration in Cilicia declared the independence of Cilicia as an Armenian autonomous republic under French protectorate. Despite the availability of abundant renewable energy sources in Armenia (especially hydroelectric and wind power), the Armenian Government is working toward building a new Nuclear Power Plant at Medzamor near Yerevan. Armenia presently maintains good relations with almost every country in the world, with two major exceptions being its immediate neighbours, Turkey and Azerbaijan. Tensions were running high between Armenians and Azerbaijanis during the final years of the Soviet Union. The Nagorno–Karabakh War dominated the region's politics throughout the 1990s. The border between the two rival countries remains closed up to this day, and a permanent solution for the conflict has not been reached despite the mediation provided by organisations such as the OSCE. Turkey also has a long history of poor relations with Armenia over its refusal to acknowledge the Armenian Genocide. Turkey was one of the first countries to recognize the Republic of Armenia (the 3rd republic) after its independence from the USSR in 1991. Despite this, for most of the 20th century and early 21st century, relations remain tense and there are no formal diplomatic relations between the two countries due to Turkey's refusal to establish them for numerous reasons. During the Karabakh conflict and bringing it as the reason, Turkey closed its land border with Armenia in 1993. It has not lifted its blockade despite pressure from the powerful Turkish business lobby interested in Armenian markets. Since 2005, however, the Armenian airline company Armavia regularly flies between the Zvartnots International Airport at Yerevan and Atatürk International Airport at Istanbul. The Treaty on Conventional Armed Forces in Europe, which establishes comprehensive limits on key categories of military equipment, was ratified by the Armenian parliament in July 1992. In March 1993, Armenia signed the multilateral Chemical Weapons Convention, which calls for the eventual elimination of chemical weapons. Armenia acceded to the Nuclear Non-Proliferation Treaty (NPT) as a non-nuclear weapo]s state in July 1993. The 7th century Khor Virap monastery in the shadow of Mount Ararat, the peak on which Noah's Ark is said to have landed during the biblical flood. The American University of Armenia in Yerevan. 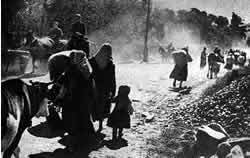 The Armenian Genocide caused widespread emigration that led to the settlement of Armenians in various countries in the world. Armenians kept to their traditions and certain diasporans rose to fame with their music. In the post-Genocide Armenian community of the United States, the so-called "kef" style Armenian dance music, using Armenian and Middle Eastern folk instruments (often electrified/amplified) and some western instruments, was popular. This style preserved the folk songs and dances of Western Armenia, and many artists also played the contemporary popular songs of Turkey and other Middle Eastern countries from which the Armenians emigrated. Richard Hagopian is perhaps the most famous artist of the traditional "kef" style and the Vosbikian Band was notable in the 40s and 50s for developing their own style of "kef music" heavily influenced by the popular American Big Band Jazz of the time. Later, stemming from the Middle Eastern Armenian diaspora and influenced by Continental European (especially French) pop music, the Armenian pop music genre grew to fame in the '60s and '70s with artists such as Adiss Harmandian and Harout Pamboukjian performing to the Armenian diaspora and Armenia; also with artists such as Sirusho, performing pop music combined with Armenian folk music in today's entertainment industry. Other Armenian diasporans that rose to fame in classical or international music circles are world renown French-Armenian singer and composer Charles Aznavour, pianist Sahan Arzruni, prominent opera sopranos such as Hasmik Papian and more recently Isabel Bayrakdarian and Anna Kasyan. Certain Armenians settled to sing non-Armenian tunes such as the heavy metal band System of a Down (which nonetheless often incorporates traditional Armenian instrumentals and styling into their songs) or pop star Cher. In the Armenian diaspora, Armenian revolutionary songs are popular with the youth. These songs encourage Armenian patriotism and are generally about Armenian history and national heroes. ^ a b "The Constitution of the Republic of Armenia (with amendments)". Constitutional Court of the Republic of Armenia. 5 July 1995. http://www.concourt.am/english/constitutions/index.htm#1. Retrieved 14 October 2012. ^ "The World Fact Book – Armenia". Central Intelligence Agency. Archived from the original on 19 July 2010. https://www.cia.gov/library/publications/the-world-factbook/geos/am.html. Retrieved 2010-07-17. ^ "Statistical Service of Armenia". World Economic Outlook Database, October 2009. IMF. Archived from the original on 10 October 2010. http://armstat.am/file/doc/99458058.pdf. Retrieved 2 September 2010. ^ "News.am". World Economic Outlook Database, October 2009. IMF. http://news.am/eng/news/46702.html. Retrieved 1 January 2011. ^ a b c d "Armenia". International Monetary Fund. http://www.imf.org/external/pubs/ft/weo/2012/01/weodata/weorept.aspx?sy=2009&ey=2012&scsm=1&ssd=1&sort=country&ds=.&br=1&c=911&s=NGDPD%2CNGDPDPC%2CPPPGDP%2CPPPPC%2CLP&grp=0&a=&pr.x=67&pr.y=6. Retrieved 2012-04-17. ^ Armenia may be considered to be in Asia and/or Europe. The UN classification of world regions places Armenia in Western Asia; the CIA World Factbook "Armenia". The World Factbook. CIA. Archived from the original on 10 October 2010. https://www.cia.gov/library/publications/the-world-factbook/geos/am.html. Retrieved 2 September 2010. "Armenia". National Geographic. http://www.nationalgeographic.com/xpeditions/atlas/index.html?Parent=asia&Rootmap=armeni&Mode=d&SubMode=w. , "Armenia". Encyclopædia Britannica. 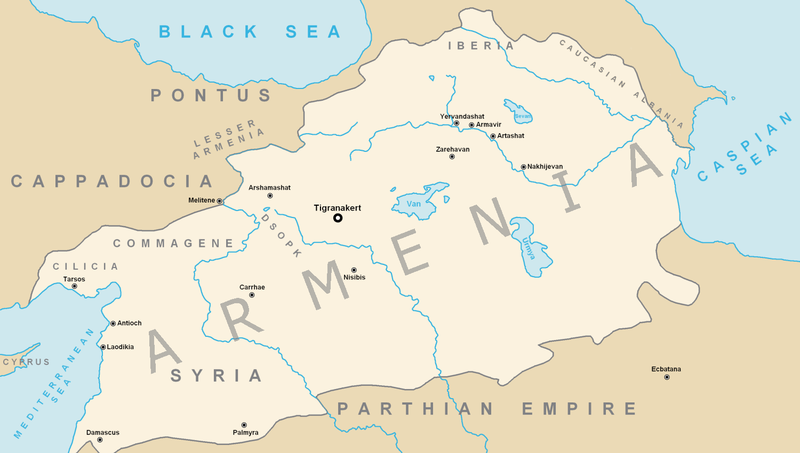 http://www.britannica.com/EBchecked/topic/35178/Armenia. and Oxford Reference Online "Oxford Reference". Oxford Reference Online. also place Armenia in Asia. 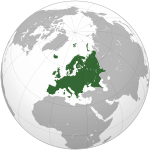 Conversely, some sources place Armenia in Europe such as "Europe". Worldatlas. Archived from the original on 15 August 2010. http://worldatlas.com/webimage/countrys/eu.htm. Retrieved 2 September 2010. ^ "The conversion of Armenia to Christianity was probably the most crucial step in its history. It turned Armenia sharply away from its Iranian past and stamped it for centuries with an intrinsic character as clear to the native population as to those outside its borders, who identified Armenia almost at once as the first state to adopt Christianity". (Garsoïan, Nina (1997). ed. R.G. Hovannisian. ed. Armenian People from Ancient to Modern Times. Palgrave Macmillan. pp. Volume 1, p.81. ). ^ "The Constitution of the Republic of Armenia, Article 8.1". President.am. Archived from the original on 20 December 2010. http://www.president.am/library/constitution/eng/?pn=1. Retrieved 2010-12-30. ^ "EUROPA – Press Releases – EU launches negotiations on Association Agreements with Armenia, Azerbaijan and Georgia". Europa (web portal). 15 July 2010. http://europa.eu/rapid/pressReleasesAction.do?reference=IP/10/955&format=HTML&aged=0&language=EN&guiLanguage=en. Retrieved 21 September 2011. ^ "Armenia-EU association agreement may be concluded shortly | Armenia News –". News.am. http://news.am/eng/news/22489.html. Retrieved 21 September 2011. ^ "3rd PLENARY ROUND OF THE EU-ARMENIA NEGOTIATIONS ON THE ASSOCIATION AGREEMENT". Ec.europa.eu. 2010-12-15. http://ec.europa.eu/delegations/armenia/press_corner/all_news/news/2010/20101215_01_en.htm. Retrieved 2012-08-28. ^ "Information Center – Official News – The Government of the Republic of Armenia". Gov.am. 27 November 2010. http://www.gov.am/en/news/item/5418/. Retrieved 21 September 2011. ^ "The first leather shoe,". CNN. http://articles.cnn.com/2010-06-09/world/armenia.old.shoe_1_shoe-cave-leather?_s=PM:WORLD. Retrieved 11 January 2011. ^ "5,900-year-old women’s skirt discovered in Armenian cave". News Armenia. 13 September 2011. http://news.am/eng/news/73915.html. Retrieved 14 September 2011. ^ "National Geographic: the first wine-making facility". National Geographic. http://news.nationalgeographic.com/news/2011/01/110111-oldest-wine-press-making-winery-armenia-science-ucla/. Retrieved 11 January 2011. ^ Kurkjian, Vahan (1958). History of Armenia (1964 ed.). Michigan: Armenian General Benevolent Union. http://penelope.uchicago.edu/Thayer/E/Gazetteer/Places/Asia/Armenia/_Texts/KURARM/home.html. Retrieved 2009-07-22. ^ Armenian Soviet Encyclopedia. Yerevan: Armenian Encyclopedia. 1987. pp. v. 12. ^ a b "The World Factbook: Armenia". CIA. Archived from the original on 14 November 2007. https://www.cia.gov/library/publications/the-world-factbook/geos/am.html. Retrieved 2007-11-15. ^ "Philippe Buache: Retraite Des Dix Mille Tabula conspectum exhibens Regionum omnium quas Cyrus Junior... MDCCLXXX". Raremaps.com. http://www.raremaps.com/gallery/detail/22549/Retraite_Des_Dix_Mille_Tabula_conspectum_exhibens_Regionum_omnium_quas/Buache.html. Retrieved 2010-12-30. ^ Kirakosian, J. S. (1972) (in Armenian). Hayastane michazkayin divanakitut'yan ew sovetakan artakin kaghakakanut'yan pastateghterum, 1828–1923 (Armenia in the documents of international diplomacy and Soviet foreign policy, 1828–1923). Yerevan. pp. 149–358. ^ "Extensive bibliography by University of Michigan on the Armenian Genocide". Umd.umich.edu. http://www.umd.umich.edu/dept/armenian/facts/gen_bib1.html. Retrieved 2010-12-30. ^ "Encyclopædia Britannica: Armenian massacres (Turkish-Armenian history)". Britannica.com. 14 December 2009. http://www.britannica.com/EBchecked/topic/35323/Armenian-massacres. Retrieved 2010-12-30. ^ "The March Referendum". http://soviethistory.org/index.php?action=L2&SubjectID=1991march&Year=1991. Retrieved 2008-11-10. ^ "The Ties That Divide". Global Heritage Fund. 17 June 2006. Archived from the original on 5 April 2008. http://web.archive.org/web/20080405071809/http://www.globalheritagefund.org/news/GHF_in_the_news/economist_ties_that_divide_june_17_06.asp. Retrieved 2009-07-22. ^ a b "Index of Economic Freedom 2009". The Heritage Foundation. http://www.heritage.org/Index/Ranking.aspx. ^ "Geographic Characteristic of The Republic of Armenia". Marzes of the Republic of Armenia in Figures, 2002–2006. National Statistical Service of the Republic of Armenia. 2007. http://www.armstat.am/file/article/marz_07_e_2.pdf. Retrieved 2009-07-22. ^ "Address by President Serzh Sargsyan to the People of Armenia and the National Assembly on 2 October 2008". President.am. http://www.president.am/events/statements/eng/?id=21. Retrieved 2010-12-30. ^ "Nations in Transit 2008" (PDF). Freedom House. http://www.freedomhouse.hu/images/fdh_galleries/NIT2008/02_tables.pdf. Retrieved 2008-06-26. ^ "Nations in Transit 2008: Armenia" (PDF). Freedom House. http://www.freedomhouse.hu/images/fdh_galleries/NIT2008/NT-Armenia-final.pdf. Retrieved 2008-06-26. ^ "Freedom in the World 2007" (PDF). Freedom House. Archived from the original on 18 February 2007. http://www.freedomhouse.org/uploads/press_release/fiw07_charts.pdf. Retrieved 2007-02-20. ^ Danielyan, Emil (20 February 2008). "Armenian Vote 'Largely Democratic'". ArmeniaLiberty, Radio Free Europe. Archived from the original on 6 March 2008. http://web.archive.org/web/20080306045216/http://www.armenialiberty.org/armeniareport/report/en/2008/02/14B31960-C791-4274-B7F0-50B571D0EADD.asp. Retrieved 2008-02-20. ^ a b "Nagorno-Karabakh: The Crisis in the Caucasus". http://www.cfr.org/publication/9148/. Retrieved 2007-04-06. ^ "Baku and Moscow – 'One Hundred Percent Strategic Partners'". Hetq Online. 27 February 2006. http://archive.hetq.am/eng/politics/0602-az.html. Retrieved 2008-04-20. ^ "Ancestry Data". U.S. Census Bureau. 2006. Archived from the original on 3 April 2008. http://web.archive.org/web/20080403032043/http%3A//www.armenianchurch.org/heritage/history/america.html. Retrieved 2009-07-22. The 2001 Canadian Census determined that there are 40,505 persons of Armenian ancestry currently living in Canada. However, these are liable to be low numbers, since people of mixed ancestry, very common in North America tend to be under-counted: the 1990 census US indicates 149,694 people who speak Armenian at home. The Armenian Embassy in Canada estimates 1 million ethnic Armenians in the US and 100,000 in Canada. The Armenian Church of America makes a similar estimate. By all accounts, over half of the Armenians in the United States live in California. ^ "RFE/RL Caucasus Report". Armenian Ministry of Foreign Affairs. 7 January 2005. http://www.armeniaforeignministry.am/news/inthenews/050107_eu.html. Retrieved 2009-07-22. ^ "Interview with RA National Assembly Speaker Artur Baghdasaryan". ArmInfo News Agency. 26 October 2005. http://www.arminfo.am/political-issue22.html. Retrieved 2009-07-22. ^ "Annual Report 2005: Armenia". Freedom House. 10 May 2004. http://www.freedomhouse.org/template.cfm?page=22&year=2005&country=6686. Retrieved 21 September 2011. ^ "KFOR Contingent: Armenia". Official Web Site of the Kosovo Force. 23 March 2007. http://www.nato.int/kfor/structur/nations/armenia.htm. Retrieved 2008-10-27. ^ "Last shift of Armenian peacekeepers in Iraq returns home". Ministry of Defence. 7 October 2008. http://www.mil.am/eng/index.php?page=2&p=0&id=633&y=2008&m=10&d=29. Retrieved 2008-10-29. ^ "Regional Administration Bodies". The Government of the Republic of Armenia. http://www.gov.am/en/regions/. Retrieved 11 September 2008. ^ Demourian, Avet (19 October 2007). "Armenian Eyes, Ears on US Genocide Vote". The Washington Post. http://www.washingtonpost.com/wp-dyn/content/article/2007/10/19/AR2007101901471.html. Retrieved 2009-07-07. ^ "HDI 2010 Index". HDRO (Human Development Report Office) United Nations Development Programme. pp. 1–3. http://hdr.undp.org/en/media/Lets-Talk-HD-HDI_2010.pdf. Retrieved 10 June 2010. ^ "Corruption Perceptions Index 2007". Archived from the original on 28 April 2008. http://www.transparency.org/policy_research/surveys_indices/cpi/2007. Retrieved 2008-04-25. ^ "Statistical Yearbook of Armenia, 2009: Population". ArmStat. http://www.armstat.am/file/doc/99458058.pdf. Retrieved 2010-02-09. ^ Paul, Amanda. "Armenia's disappearing population". Archived from the original on 27 July 2011. http://www.todayszaman.com/columnist-251720-armenias-disappearing-population.html. Retrieved 27 July 2011. ^ Turay, Anna. "Tarihte Ermeniler". Bolsohays:Istanbul Armenians Like many other ethnicities Armenians in India too have played a role historically and had an impact historically. Today however the community has been reduced to about a hundred living in Calcutta.. Archived from the original on 9 February 2008. http://web.archive.org/web/20080209171028/http://www.bolsohays.com/webac.asp?referans=1. Retrieved 2007-01-04. ^ "Jerusalem – The Old City: The Armenian Quarter". Jewish Virtual Library. http://www.jewishvirtuallibrary.org/jsource/Society_&_Culture/geo/armenianq.html. Retrieved 2009-07-22. ^ "San Lazzaro degli Armeni – Venice for Visitors". Europeforvisitors.com. Archived from the original on 22 November 2010. http://europeforvisitors.com/venice/articles/san_lazzaro_degli_armeni.htm. Retrieved 2010-12-30. ^ "Population in Nagorno-Karabakh 2007". National Statistical Service of Nagorno-Karabakh Republic. Archived from the original on 16 April 2010. http://www.webcitation.org/5p1nNnVNJ. Retrieved 2009-07-22. ^ "Problems of Bilingualism in Armenia" (PDF). http://www.lingref.com/isb/4/092ISB4.PDF. Retrieved 2010-01-25. : "In 1999 the decision of the Government of Armenia that the Russian language would be used in the system of education and cultural and social life of the Republic of Armenia was approved and adopted. This decision contained the concept about a place and role of the Russian language in the system of education." ^ "Russian Language Enjoying a Boost in Post-Soviet States". Gallup.com. Archived from the original on 16 June 2010. http://www.gallup.com/poll/109228/russian-language-enjoying-boost-postsoviet-states.aspx. Retrieved 2010-06-15. ^ a b c "Microsoft Word - cjl - ARM_MPSEURO_countryprofile.doc" (PDF). http://www.euro.who.int/document/MPS/ARM_MPSEURO_countryprofile.pdf. Retrieved 2010-01-25. ^ "Human Development Report 2009 – Armenia". Hdrstats.undp.org. Archived from the original on 9 January 2010. http://hdrstats.undp.org/en/countries/data_sheets/cty_ds_ARM.html. Retrieved 2010-01-25. ^ "Armenia – Which Nation First Adopted Christianity?". Ancienthistory.about.com. 29 October 2009. http://ancienthistory.about.com/od/neareast/f/1stchristian.htm. Retrieved 2010-01-25. ^ "Visit Armenia, It is Beautiful". Visitarmenia.org. http://www.visitarmenia.org/. Retrieved 2010-01-25. ^ "Armenia Information – Welcome to Armenia". Welcomearmenia.com. Archived from the original on 6 February 2010. http://www.welcomearmenia.com/main.php?page=armeniainformation&sid=104&lang=eng. Retrieved 2010-01-25. ^ "Blog Archive » Which is the first country to adopt Christianity?". Did You Know it. http://www.didyouknow.it/religion/first-country-to-adopt-christianity/. Retrieved 2010-01-25. ^ "The Armenian Apostolic Church (World Council of Churches)". http://www.oikoumene.org/?id=5211. ^ "Armenian Evangelical Christian Baptist". Armbaplife.am. http://armbaplife.am/. Retrieved 2012-08-28. ^ "Despite poverty, Baptists prosper in Armenia". Biblical Recorder. Baptist State convention of North Carolina. 17 July 2004. http://goodnewsadvertising.com/biblical_recorder.pdf. Retrieved 2010-06-28. ^ "By Location". Adherents.com. http://adherents.com/adhloc/Wh_18.html. Retrieved 2010-01-25. ^ "Armenian Presbyterian Church to Commemorate 1700th Anniversary of Christianity in Armenia with Concert and Khachkar Dedication". The Armenian Reporter. 20 October 2001. Archived from the original on 10 May 2011. http://web.archive.org/web/20110510012451/http://www.highbeam.com/doc/1P1-79125406.html. Retrieved 2011-05-21. ^ "PC(USA) – Presbyterian Peacemaking Program – International Peacemaking – Dr. Nazeli Vardanyan, Armenia". Pcusa.org. 11 December 2009. http://pcusa.org/peacemaking/intl/09peacemakers/armenia-nazeli.htm. Retrieved 2010-01-25. ^ Cornelius, Janet Duitsman (1999). Slave missions and the Black church... – Google Books. Google Books. ISBN 978-1-57003-247-9. http://books.google.com/?id=aGGdyAlobAEC&pg=PA120. Retrieved 2010-01-25. ^ "Ambassadors in Sport? : Independent Armenia far below the glory of Soviet times on the pitch, mat – Features". ArmeniaNow.com. http://armenianow.com/?action=viewArticle&AID=1910&CID=1973&IID=&lng=eng. Retrieved 2010-01-25. ^ "Ambassadors in Sport? : Independent Armenia far below the glory of Soviet times on the pitch, mat – Features". ArmeniaNow.com. http://armenianow.com/?action=viewArticle&AID=1910&CID=1973&IID=&lng=eng. Retrieved 2012-08-28. ^ "Chess News – BBC lecture: Armenia, the cleverest nation on earth". ChessBase.com. http://www.chessbase.com/newsdetail.asp?newsid=6679. Retrieved 2010-12-30. Chisholm, Hugh, ed (1911). "Armenia". Encyclopædia Britannica (11th ed.). Cambridge University Press. This page uses content from the English language Wikipedia. The original content was at Armenia. The list of authors can be seen in the page history. As with this Familypedia wiki, the content of Wikipedia is available under the Creative Commons License.